Top floor two-bedroom and den unit with NE exposure at 100 Lakeshore Drive. This condo is distinctly modern with slate tile floors, granite countertops, stainless appliances and stylish light fixtures. Steps from Okanagan Lake. Walk across one street to the lake and casino; across another to the farmer's market and restaurants. Distinct advantages to being in the 1st phase of this development: gas fireplace, large pergola covered deck with BBQ outlet, heated secure parking garage. Best of all: solid concrete construction makes it very soundproof. Pool, hot tub, sauna, 2 gyms. 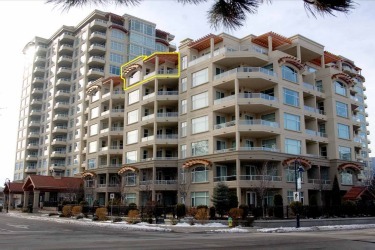 Compare the square footage and finishings: excellent value in this unit.